This mob spawns at -785, 220, -431 and -1115, 225, -431 in the undead prison. Casts "Bonesnap" on its target every 20 seconds. Spawns two adds a skelehelper at 80%, 60%, 40%, 20%, and 5% health. 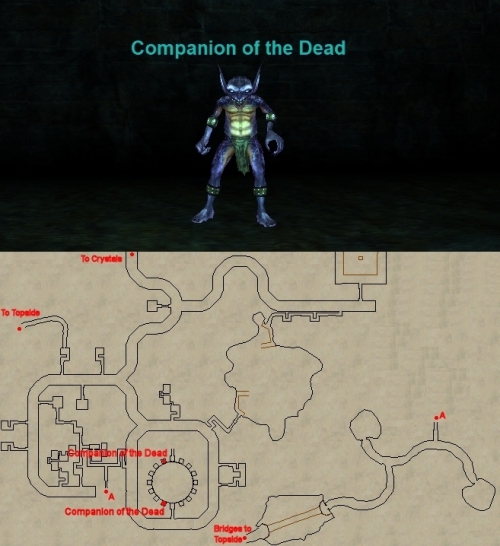 These adds cast "Skeleheal" on the Companion of the Dead. This page last modified 2019-02-16 02:58:40. A deadfiend goblin is PHer. Magelo says there are at least 5 spawn spots within the undead prison circle, and one even just outside in the underground tunnels. Lots of mobs here see thru all invis. There are usually 3 deadfiends up at once. I always find them inside cells.